What Can You Do with FordPassTM? With a wide variety of Ford connectivity features to choose from, the new FordPassTM mobile app is here to enhance your Ford ownership experience. The FordPassTM guide is chock full of details about features that you soon won’t know how to live without. Need to find gas before your Ford vehicle runs out? The FordPassTM app is here to help. Want to upgrade your current Ford vehicle to a newer model? FordPassTM can help with that, too! Contact our Ford dealership in Wichita, KS, to learn all about the app that will change the way you look at your Ford. Can FordPassTM connect to my vehicle? To enjoy the full breadth of features in the app, make sure your Ford is a SYNC® Connect-enabled vehicle like the 2019 Ford F-150 or 2019 Escape. With the FordPassTM app, you can do everything from checking your fuel level and mileage to activating the remote start feature on your Ford. Your FordPassTM-enabled vehicle will even send you service reminders. Just want to check your oil level before embarking on that big trip across Kansas? The FordPassTM app can assist with that. Is your Ford vehicle due for service? The FordPassTM app can assist with that. Whenever you are ready, the app can put you in direct contact with the Ford service center at Rusty Eck Ford for any repairs or maintenance you need. The app can even notify you as to what service you may be due for. Wondering how can you expedite the service checkout process with FordPassTM? FordPay, which is featured in the app, is the fastest and easiest way to pay for Ford maintenance and repairs. Just add your preferred method of payment into the Wallet feature in the app and you’re all set! Ready to get your specific FordPassTM login? Open up the Google Play store on your Android device or open the App Store on your Apple device to begin. You owe it to yourself to enjoy all the benefits a new Ford can offer, so download FordPassTM today. Is the FordPassTM app not working for you? 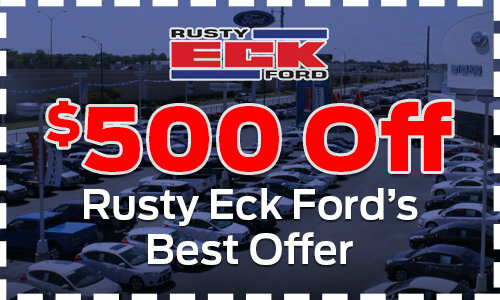 We can assist with that and any other Ford-related inquiries you may have at Rusty Eck Ford in Wichita. We look forward to working with you!